Partial exclusion from US sanctions gives India reasons to sigh with relief, but not to cheer. “Our objective is to starve the Iranian regime of the revenue it uses to fund violent and destabilizing activities,” declared U.S. Secretary of State Mike Pompeo, briefing the press just as the United States was to hit Iran with sanctions on November 5. Yet, as it turned out, eight countries were granted a waiver from U.S. sanctions when it comes to their oil imports from Iran. This means they may continue to purchase Iranian crude and not be pressed with sanctions from Washington because of this. The eight lucky nations include China and India, the two biggest buyers of Tehran’s crude. This adds yet another question mark on the feasibility of the goal to “starve” the Iranian regime of revenue. New Delhi has reasons to sigh with relief, but hardly to cheer. The toughening of Washington’s attitude towards Tehran will make many aspects of India-Iran relations volatile. When it comes to global foreign policy, the New Delhi establishment has made itself a master of walking a tightrope, regardless of who was in power in India. Just to give a few examples: In the last years and months India has signed two important deals of military importance with the United States (the Logistics Exchange Memorandum of Agreement, or LEMOA, and the Communications Compatibility and Security Agreement, or COMCASA) and purchased American helicopters for its forces (Apaches and Chinooks). Just about a month after the U.S.-India 2+2 talks and signing the COMCASA deal, however, Indians hosted Russian President Vladimir Putin and inked a deal to purchase the S-400 missile defense system. New Delhi is right in the assumption that with its position and importance it should not become a clear, one-sided ally of any global power. It simply wants the best it can get out of cooperation with various countries, and that is a perfectly pragmatic approach. Iran’s oil on offer is one of the best India can get, though it is not indispensable. The country is close, the price is good, the political relations (apart from the pressing American factor) are rather stable and there is also some important cooperation in other areas. India has a tremendous appetite for energy resources, while Iran has lots of oil to sell but a shrinking market to deal with. This should put New Delhi in a good bargaining position. India is a more important oil buyer for Iran than Iran is a seller to India. Apart from the hike in 2016-17, India’s crude petroleum import from Iran constituted usually between 7 to 9 percent of its total imports of this product since 2010, while in the same period India was Iran’s second biggest buyer (after China), often taking between 20 to 23 percent of Iran’s total crude exports. History demonstrates that the Indian economy is very vulnerable when it comes to global oil prices and hence extracting a reasonable price from any given seller is a crucial factor. The crude summary is that crude dominates in the Iran-India bilateral trade. Yet, as Iran possesses vast natural gas resources and India has the LNG capacity – four terminals are running and a fifth one will be opened soon – gas could be an important part of future ties, once Tehran will have the means to liquefy it. It is no surprise, therefore, that New Delhi, while developing its close and increasingly strategic ties with Washington, wants at the same time to deal with Tehran. Faced both with American sanctions for buying the Russian S-400 and for its oil trade with Iran, the Indian government kept a straight face (while behind the scenes it most possibly promised to reduce its crude imports from Iran). After the S-400 deal with Russia was signed, U.S. President Donald J. Trump declared that New “will soon find out” whether it will be granted a waiver from him from America’s Russia-related sanctions. What India did find out soon, however, was that it was exempted from American sanctions on Iranian oil trade. 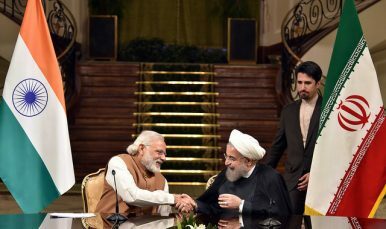 Soon after it was reported Washington will also grant India a second sanctions waiver: regarding its operations in the Iranian port of Chabahar, which Tehran and India are jointly developing. If it gets the waiver on the S-400 too, one can say it got lucky thrice. It seems India played its cards with a global power cold and well, knowing its own importance for the United States. But picking the best New Delhi can get in its relations with various states is usually not the same as maintaining equidistance. The tightrope metaphor is no longer useful here. Every decision means pulling various strings; and the entire exercise is much more similar to balancing on the spider’s web than on a tightrope. Despite the waivers, the American sanctions will limit India’s options. Take currency. Faced with the rising specter of upcoming sanctions since half of the year, New Delhi and Tehran decided to have the dues for Iranian crude paid in Indian rupees routed through Indian banks, rather than in euro through a German and an Indian state bank, as before. But India has a trade deficit with Iran. This means that while Tehran is not buying that much from India it is now getting paid for its crude with rupees, which it can hardly use for anything else than for paying for the products and services of Indian companies. There are other vulnerabilities, too. One of clients for Iranian crude in India, albeit not the top one, is Nayara Energy (previously Essar Oil). The majority of its shares belong to Russia’s Rosneft. Another Indian oil company, Chennai Petroleum, is in 15.4 percent possessed by an Iranian company, Naftiran Intertrade. These and other aspects show that American sanctions and other pressures on Russia and Iran may indirectly affect the Indian economy and its international trade in a number of ways. Other Indian companies may fear the sanction spillover as well. In the past months some Indian companies, including the ones mentioned in this paragraph, decreased their orders from Iran, anticipating sanctions. The same indirect effect on India will work in the case of the Chabahar port. While describing its importance would require a separate story the Iranian port, in a nutshell, is a strategic asset not only for Iran, but also Afghanistan and India. Chabahar port opens a short way for landlocked Afghanistan to trade through the seas without crossing Pakistan’s territory. It thereby decreases Afghanistan’s dependence on Pakistan, which is to India’s advantage. India, has therefore, invested in the Chabahar port. But even in the previous years, before Washington walked out of the Iran deal and threatened Tehran with new sanctions, many companies turned out to be reluctant to engage themselves in the port development, feeling that American actions against Iran may cause roadblocks or troubles. The currently expected U.S. waiver on Chabahar may not be enough to convince experienced companies that the future of this port is stable and investing in it is a viable option. The White House administration is seemingly sympathetic to the idea of decreasing Afghanistan’s dependence on Pakistan through Chabahar, as the waiver on port development reportedly also includes an exemption on the construction of the railway from Chabahar towards Afghanistan. But isolating Iran inadvertently isolates Afghanistan as well, and thus one goal of the American foreign policy cancels the other goal. Moreover, even the exemption on Iranian oil is not a solid rock to build on. Pompeo declared that the waivers are “temporary allotments” and Washington is continuing its negotiations with all eight exempted nations to reduce the trade to zero. The sanctions waiver allows India to remain in its place in the web of economic and political tightropes. But the future of New Delhi’s energy cooperation with Tehran will remain influenced by the dynamics of U.S.-Iran relations. Iran’s high-sulfur oil is a product India can purchase from other sources as well, even if at somewhat higher prices. But if Washington’s wall of international isolation which encompassed Iran remains in place or gets thicker, the project of Chabahar port development may be further slowed down. The Diplomat’s Sanjay Kumar speaks with Sujata Ashwarya Cheema about the Iran deal's effect on India.